The Laboratory of Solid Tumor Genetics was created in 2004 in the context of launch of the first the National Plan Against Cancer. The goal of this creation was to develop a translational activity in the field of genetics of solid tumors. We are involved both in a clinical activity (affiliation: Nice University Hospital (CHU de Nice) and in a research program (affiliation: IRCAN). Our two main research interests are focused on genetics of soft tissue tumors and renal cell carcinomas, respectively. In addition, we closely interact with the French National Cancer Institute (INCa), the Cancéropôle Provence-Alpes-Côte d’Azur and the French Sarcoma Group (GSF-GETO). We also have a teaching and tutorial activity in oncology and genetics at the Faculty of Medicine of Nice as well as in national courses. The 28 French regional platforms were created in 2006 on the behalf of INCa in order to provide molecular tests for diagnosis and for predictive response to personalized targeted drugs (http://www.e-cancer.fr/soins/plates-formes-hospitalieres-de-genetique-moleculaire). 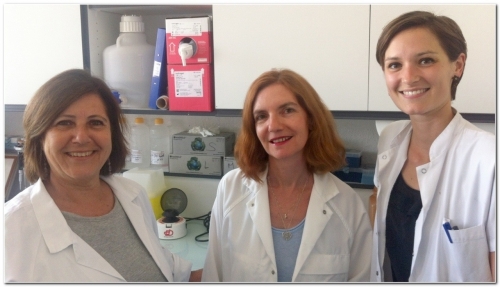 Our clinical laboratory belongs to the Platform of Molecular Genetics of Cancers of the eastern part of Provence-Alpes-Côte d’Azur (PACA-est) region (six laboratories including ours; regional coordinator: F. Pedeutour). We provide a comprehensive test panel for diagnosis and evaluation of solid tumors, such as pediatric tumors, tumors of soft tissues and bones, brain tumors, skin tumors or renal tumors. We perform cytogenetic and molecular analyses as complementary tools of histopathological diagnosis, in collaboration with pathologists, surgeons and oncologists. We receive each year more than a thousand fresh, frozen or fixed-paraffin-embedded samples for chromosomal or molecular analyses. Depending on the indication and nature of the biological samples, we do cytogenetic analysis including preparation of karyotypes, metaphase and interphase based fluorescence in situ hybridization (FISH), comparative genomic hybridization based array (CGH array) as well as molecular analysis including mutation detection by RT-PCR, pyrosequencing, real time PCR or Sanger sequencing. The detection of somatic chromosomal alterations such as genomic amplification, translocations, fusion genes, deletions or DNA sequence anomalies such as nucleotide mutations is a powerful ancillary tool for diagnosis of solid tumors and therapeutic management. It helps the distinction between benign and malignant tumors and the recognition of a variety of malignant tumor types or subtypes. In particular, we are expert in the field of molecular diagnoses in sarcomas. Chromosomal analyses are also helpful for evaluation of prognosis (a typical example is the detection of MYCN amplification in neuroblastomas or genomic profiles in choroid melanomas). A part of our clinical activity consists in detection of DNA mutations that are predictive of response or non-response to targeted therapies, such as tyrosine kinase inhibitors or monoclonal antibodies. The main current indications are mutations of KRAS, BRAF, EGFR, ALK, HER2, KIT and PDGFRA in colon cancers, lung cancers, melanomas and stromal gastro-intestinal tumors (GIST). Our research projects are closely related to our clinical activity. We aim: -1) to identify novel chromosomal and genetic anomalies in order to improve classification and diagnosis of solid tumors and -2) to explore the functional consequences of these novel anomalies. Adipose tissue tumors are the most frequent human tumors. They are mainly represented by lipomas that are very common benign lesions. The malignant adipose tumors include three main subtypes, well-differentiated and dedifferentiated liposarcomas, myxoid and round cell liposarcomas and pleomorphic liposarcomas. The current challenges for improving the surgical and therapeutic management of adipose tumors are identification of novel diagnostic and prognostic markers as well as of therapeutic targets. Strikingly, it can be noted the high frequency of rearrangements of chromosome 12 long arm (12q). Indeed, chromosomal anomalies in lipomas mainly involve structural balanced and non-balanced alterations of chromosome 12 long arm in the region of HMGA2 (12q14.3) whereas amplification of the 12q14-15 region including MDM2 is the hallmark of well-differentiated/dedifferentiated liposarcomas and rearrangements of DDIT3 (12q13.3) are characteristic of myxoid liposarcomas. We have shown that HMGA2 is rearranged not only in lipomas but is also recurrently amplified in well-differentiated/dedifferentiated liposarcomas (Italiano et al., 2008 and 2009). We also recently reported the first observation of overexpression of HMGA2 in a unique case of lipomatosis (Saada et al., 2012). We therefore hypothesize that HMGA2 is a key gene in adipose lesions and tumors. We have shown that HMGA2 overexpression in lipomas is not always associated to chromosome 12q anomalies and is not significantly correlated to inhibition of let7 miRNA expression (Bianchini et al., 2011). Our aim is to understand the complex mechanisms of dysregulation of HMGA2 and how these alterations contribute to adipose tissue pathogenesis. Renal cell carcinomas (RCC) account for approximately 10 500 novel cases/year in France and are responsible of the death of 4000 patients/year. The last World Health Organization (WHO) classification describes ten types of RCC, the most frequent of which are clear cell RCC followed by papillary RCC and chromophobe RCC. A precise and reliable histopathological typing of RCC is crucial since survival and response to treatment is variable from one type to another. Notably, since 2006 treatment of clear cell RCC has dramatically benefited from the use of targeted antiangiogenic molecules. However diagnosis of RCC is often difficult and approximately 15% of cases remain “unclassified”. Though some correlations between histology and genetics have been well established (for instance, deletion of VHL gene at 3p25 in clear cell RCC, trisomy 7 and 17 in papillary RCC or hypodiploidy in chromophobe RCC), programs of exploration of genomic and molecular profiles of RCC are necessary to improve our knowledge of these tumors. To note, a particular subtype, RCC with Xp11 translocation and rearrangement of TFE3 has been individualized thanks to chromosomal studies. Since 2005 we have established a collaboration with the departments of Urology (PR Amiel) and the central laboratory of pathology (Pr Michiels) of Nice university hospital. We have karyotyped all RCC operated in the urology department (50/year). We have extended the chromosomal analyses by combining additional immunohistochemistry, FISH and array-CGH analysies. We have focused our research on two types of morphologically challenging RCC: RCC with Xp11 translocation and type 2-papillary RCC. Our aim is to use genomic tools to provide a better characterization of unclassified and rare subtypes of RCC. Research Project 1 : "Genomic and functional characterization of adipose tissue tumors"
"Genomic and functional characterization of adipose tissue tumors"
Liposarcomas are the most common type of soft tissue sarcomas (STS) and among them well-differentiated/dedifferentiated liposarcomas (WDLPS/DDLPS) are the most frequent. WDLPS are composed mostly of mature fat whereas DDLPS contain two cell components in variable proportions: a WDLPS component and a non lipogenic sarcoma component of variable histological grade. More than 50% of DDLPS will relapse locally, a significant proportion of patients will remain with non-resectable disease. 1- Clinical and histological diagnosis of these tumors can be difficult. 2- Metastases occur in about 20% of DDLPS. Standard chemotherapy is poorly efficient and alternative options are so far limited underscoring the urgent need to identify new therapeutic targets. Our aim is to characterize molecular features of liposarcoma in order to identify diagnostic markers and relevant therapeutic targets. We have already shown that HMGA2 plays an important role in adipose tissue tumorigenesis. We have recently identified the lipid phosphate phosphatase PPAP2B as a novel recurrent translocation partner of HMGA2 in lipomas. Using the hMADS (human Multipotent Adipose-Derived Stem) cells as a model of human adipocyte differentiation we are investigating the role of the LPP in adipogenesis (Collaboration with the teams of C. Dani and EZ. Amri Institut Biologie Valrose (IBV), Nice). We have also determined the expression profiles of the LPP in WDLPS and DDLPS and we are performing functional studies on the WDLPS cell lines that we have established in the lab to determine whether LPP play a role in liposarcomagenesis. - The pattern of expression and localisation of syndecans, FGFs and FGFRs in WDLPS/DDLPS both in a large collection of primary tumors and on WDLPS /DDLPS cell lines. - The effects of modulating SDC1, FGFR expression in WDLPS and DDLPS cells on cell proliferation, cell cycle, apoptosis and on their capacity to differentiate in adipocytes. 1. Italiano A., Bianchini L., Keslair F., Bonnafous S., Cardot N., Coindre JM., Dumollard JM., Hofman P., Leroux A., Mainguené C., Peyrottes I., Ranchere-Vince D., Tran A., Gual P., Pedeutour F. HMGA2 is the partner of MDM2 in well-differentiated and dedifferentiated liposarcomas whereas CDK4 belongs to a distinct inconsistent amplicon. Int. J. Cancer, 2008, 122 : 2233-2241. 2. Italiano A., Bianchini L.,Gjernes E., Keslair F., Ranchere-Vince D., Dumollard JM., Haudebourg J., Leroux A., Mainguené C., Terrier P., Chibon F., Coindre JM., Pedeutour F. Clinical and biological significance of CDK4 amplification in well-differentiated and dedifferentiated liposarcomas. Clin. Cancer Res., 2009, 15 : 5696-5703. 3. Bianchini L., Saada E., Gjernes E., Marty M., Haudebourg J., Birtwisle-Peyrottes I., Keslair F., Chignon-Sicard B., Chamorey E., Pedeutour F. Let-7 microRNA and HMGA2 levels of expression are not inversely linked in adipocytic tumors: analysis of 56 lipomas and liposarcomas. Genes Chromosomes Cancer, 2011, 50 : 442-455. 4. Wagner KD., Benchetrit M., Bianchini L., Michiels JF., Wagner N. Peroxisome Proliferator-Activated Receptor Beta/Delta (PPARa/d) is highly expressed in liposarcoma and promotes migration and proliferation. J Pathol., 2011, 224 : 575-588. 5. Saada E., Bianchini L, Mouroux J., Dupré F., Butori C ;, Birtwisle-Peyrottes I., Padovani B., Yver M., Ferrari C., Pedeutour F. First description of inhibition of let-7 microRNA expression and HMGA2 overexpression in a case of deep-seated diffuse lipomatosis. Histopathology, 2012, 61: 519-522. 6. Pedeutour F., Maire G., Pierron A., Thomas DM, Garsed DW., Bianchini L, Duranton-Tanneur V., Cortes-Maurel A., Italiano A., Squire J., Coindre JM. A newly characterized human well-differentiated liposarcoma cell line contains amplification of the 12q12-21 and 10p11-14 regions. Virchows Arch., 2012, 461: 67-78. 7. Bianchini L., Birtwisle L., Saada E., Bazin A., Long E., Roussel JF., Michiels JF., Forest F., Dani C., Myklebost O., Birtwisle-Peyrottes I., Pedeutour F. Identification of PPAP2B as a novel recurrent translocation partner gene of HMGA2 in lipomas. Genes Chromosomes Cancer, 2013, 52: 580-590. Research Project 2 : " Identification of novel genetic markers in renal tumors "
" Identification of novel genetic markers in renal tumors "
The management of renal cell carcinoma (RCC) is a major health issue. Both the incidence of metastatic disease at the time of initial diagnosis and the rate of mortality are high. The diagnosis of RCC is based on morphological, immunohistochemical and genetic features. The classification of the World Health Organization (WHO) lists ten types of renal cell tumors. Clear cell RCC (ccRCC) and papillary RCC (pRCC) are the most frequent types. Genetic analysis of RCC is of great diagnostic use and helps for understanding the pathogenesis of these tumors. The therapeutic management of patients has been improved by genetic data in ccRCC. Indeed, it is well established that the VHL gene is inactivated in ccRCC. This inactivation results in tumor angiogenesis through the HIF/VEGF pathway and is the basis of the development of anti-angiogenic therapies to treat metastatic disease. We believe that the genetic characterization of pRCC might result in assessment of personalized treatments. pRCC classically show a gain of chromosomes 7 and 17 and loss of the Y chromosome (Figure 1). Moreover, approximately 10% of sporadic pRCC present mutations in the MET gene (Figure 2). chromosome 7 and 17 and a loss of chromosome Y (▼), additional anomalies are also present (▼). Reverse-direction sequencing of the exon 16 of the MET gene. A point mutation c.3334C>T ; p.His1112Tyr (*) is observed. Mutations within exons 14 to 19 of MET are observed in approximately 13% of papillary renal cell carcinoma of type 1. Since 2005, in collaboration with the Department of Urology (Pr Amiel) and the Central Laboratory of Pathology (Pr Michiels), renal tumors operated at the University Hospital of Nice have been systematically studied by molecular cytogenetic methods. We also established a collaboration with the Department of Pathology of Princess Grace Hospital in Monaco (Dr Dupré). Our approach combines comparative genomic hybridization on microarray (array-CGH), fluorescence in situ hybridization (FISH), conventional karyotyping and targeted sequencing. In collaboration with the genomic platform of IRCAN (team leader G. Cristofari), we also integrate targeted high-throughput sequencing. Our aim is to identify new genetic markers of renal tumors, useful for diagnosis and treatment. We are particularly interested in "unclassified" tumors such as tumor combining several types of RCC (1,2,3,4) or challenging diagnosis tumors such as pRCC type 2. We hypothesize that the entity pRCC of type 2 is actually a heterogeneous group of tumors. Some pRCC type 2 derive from pRCC type 1 while some may correspond to distinct origin. In addition, some rare benign renal tumors can be difficult to diagnose correctly and would benefit from a better genetic characterization. This is the case of metanephric adenomas (4). We are also interested in studying genetic factors of predisposition to RCC (5). (1) Haudebourg J, Hoch B, Fabas T, Burel-Vandenbos F, Carpentier X, Amiel J, Cardot-Leccia N, Michiels JF, Pedeutour F. A novel case of t(X;1)(p11.2;p34) in a renal cell carcinoma with TFE3 rearrangement and favorable outcome in a 57-year-old patient. Cancer Genet Cytogenet. 2010;200(2):75‑78. (2) Haudebourg J, Hoch B, Fabas T, Cardot-Leccia N, Burel-Vandenbos F, Vieillefond A, Amiel J, Michiels JF, Pedeutour F. Strength of molecular cytogenetic analyses for adjusting the diagnosis of renal cell carcinomas with both clear cells and papillary features: a study of three cases. Virchows Arch. 2010;457(3):397‑404. (3) Calderaro J, Moroch J, Pierron G, Pedeutour F, Maillé P, Soyeux P, de la Taille A, Couturier J, Vieillefond A, Rousselet MC, Delattre O, Allory Y. SMARCB1/INI1 inactivation in renal medullary carcinoma, Histopathology, 2012, 61:428-35. (4) Dadone B, Ambrosetti D, Carpentier X, Duranton-Tanneur V, Burel-Vandenbos F, Amiel J, Pedeutour F. A renal metanephric adenoma showing both a 2p16-24 deletion and a BRAF V600E mutation: a synergistic role for a tumor suppressor gene on chromosome 2p and BRAF activation ? Cancer Genet., 2013, 206 (9-10) : 347-52. (5) Doyen J, Carpentier X, Haudebourg J, Hoch B, Karmous-Benailly H, Ambrosetti D, Fabas T, Amiel J, Lambert JC, Pedeutour F. Renal cell carcinoma and a constitutional t(11;22)(q23;q11.2): case report and review of the potential link between the constitutional t(11;22) and cancer. Cancer Genet. 2012;205(11):603‑607. (6) Grepin R, Ambrosetti D, Marsaud A, Gastaud L, Amiel J, Pedeutour F, Pagès G. The relevance of testing the efficacy of anti-angiogenesis treatments on cells derived from primary tumors : a new method for the personalized treatment of renal cell carcinoma. PlosOne, 2014, Mar27;9(3):e89449. "Rares Cancers : patients, researchers, hand in hand"
Laurence Bianchini and Florence Pedeutour received a price from the "Info-Sarcomes Association"
All informations are available on http://www.infosarcomes.org/projets-de-lannee-2015. MET immunolabeling is a useful predictive tool for MET gene amplification in glioblastoma. Neuropathol Appl Neurobiol., 2016, Mar 4. Lonchamp E, Bellocq JP, Rouleau E.
Molecular Testing in Metastatic Colorectal and Non-Small Cell Lung Cancer. J Mol Diagn., 2016, Mar;18(2):205-14. Zaragosi LE, Dadone B, Michiels JF, Marty M, Pedeutour F, Dani C, Bianchini L.
Syndecan-1 regulates adipogenesis: new insights in dedifferentiated liposarcoma tumorigenesis. Karanian M, Pérot G, Coindre JM, Chibon F, Pedeutour F, Neuville A.
Fluorescence in situ hybridization analysis is a helpful test for the diagnosis of dermatofibrosarcoma protuberans. Gugenheim J, Duffaud F, Pedeutour F.
Spatio-temporal genetic heterogeneity of CTNNB1 mutations in sporadic desmoid type fibromatosis lesions. Virchows Arch., 2015, Dec 14. Battistella M, Bazin A, Gal J, Michiels JF, Coindre JM, Pedeutour F, Bianchini L.
Prognostic value of HMGA2, CDK4, and JUN amplification in well-differentiated and dedifferentiated liposarcomas. Dadone B, Refae S, Lemarié-Delaunay C, Bianchini L, Pedeutour F.
Molecular cytogenetics of pediatric adipocytic tumors. Åman P, Nishio J, Schildhaus HU, Kirfel J, Schirmacher P, Wardelmann E, Buettner R, Hartmann W.
SRC inhibition represents a potential therapeutic strategy in liposarcoma. Int J Cancer, 2015, Dec 1;137(11):2578-88. Carpentier X, Michiels JF, Amiel J, Pedeutour F.
Genes Chromosomes Cancer, 2015, Jun;54(6):369-82. Brookwell R, Myklebost O, Meza-Zepeda L, Holloway AJ, Pedeutour F, Choo KH, Damore MA, Deans AJ, Papenfuss AT, Thomas DM. The architecture and evolution of cancer neochromosomes. Grépin R, Ambrosetti D, Marsaud A, Gastaud L, Amiel J, Pedeutour F, Pagès G.
a new method for the personalized treatment of renal cell carcinoma. Dadone B, Ambrosetti D, Carpentier X, Duranton-Tanneur V, Burel-Vandenbos F, Amiel J, Pedeutour F.
tumor suppressor gene on chromosome 2p and BRAF activation ? Comparative cost analysis of molecular biology methods in the diagnosis of sarcomas. EGFR, KRAS, BRAF, and HER-2 molecular status in brain metastases from 77 NSCLC patients. Natale R, Thariat J, Vedrine PO, Bozec A, Peyrottes I, Marcy PY, Haudebourg J, Pedeutour F, Saâda E, Thyss A. Conservative multimodal management of a primitive neuroectodermal tumor of the thyroid. Brest P, Vouret-Craviari V, Klionsky DJ, Carle GF, Hofman P, Mograbi B.
Autophagy plays a critical role in the degradation of active RHOA, the control of cell cytokinesis, and genomic stability. Identification of PPAP2B as a novel recurrent translocation partner gene of HMGA2 in lipomas. Genes Chromosomes Cancer, 2013, Jun;52(6):580-90. Harnet JC, Pedeutour F, Raybaud H, Ambrosetti D, Fabas T, Lombardi T.
mutational analysis of β-catenin in this unusual lesion of the jaws. J Oral Maxillofac Surg., 2013, Apr;71(4):706-13. Burel-Vandenbos F, Ambrosetti D, Coutts M, Pedeutour F.
EGFR mutation status in brain metastases of non-small cell lung carcinoma. J Neurooncol., 2013, Jan 111(1):1-10. Figarella-Branger D, Pedeutour F, Chaffanet M, Birnbaum D.
Genes Chromosomes Cancer, 2013, Feb 52(2):156-64.
between the constitutional t(11;22) and cancer. Cancer Genet. 2012 , Nov 205(11):603-7. Vieillefond A, Rousselet MC, Delattre O, Allory Y.
SMARCB1/INI1 inactivation in renal medullary carcinoma. Histopathology, 2012, Sept. 61 (3), 428-435. Italiano A, Squire JA, Coindre JM. Pedeutour F, Deville A, Steyaert H, Ranchere-Vince D, Ambrosetti D, Sirvent N.
Rearrangement of HMGA2 in a case of infantile lipoblastoma without PLAG1 alteration. Pediatr Blood Cancer, 2012 May 58(5):798-800. Darini CY, Pisani DF, Hofman P, Pedeutour F, Sudaka I, Chomienne C, Dani C, Ladoux A.
Self-renewal gene tracking to identify tumour-initiating cells associated with metastatic potential. Wagner KD, Benchetrit M, Bianchini L, Michiels JF, Wagner N.
Italiano A, Michalak S, Soulié P, Peyron AC, Pedeutour F.
Acta Neuropathologica, 2011 May 121(5):669-70. 56 lipomas and liposarcomas with molecular cytogenetic data. Genes Chromosomes Cancer, 2011 Jun 50: (6):442-55. Guillou L, Pedeutour F, Duval H, Collin C, de Pinieux G.
primary fibro-osseous lesions of the bone. Mod Pathol. 2011, May 24(5):624-37. Leclerc-Mercier S, Pedeutour F, Fabas T, Glorion C, Brousse N, Fraitag S.
A potentially misleading case of a Plexiform Fibro-Histiocytic Tumor in a child with molecular and cytogenetic analysis. Pediatric Dermatol, 2011, 28: 26-29. Stacchiotti S, Pedeutour F, Negri T, Conca E, Marrari A, Palassini E, Collini P, Keslair F, Morosi C, Gronchi A, Pilotti S, Casali PG. Dermatofibrosarcoma protuberans-derived fibrosarcoma: Clinical history, biological profile and sensitivity to imatinib. Int J Cancer, 2011, 129 : 1761-1772. Saâda E, Peoc'h M, Decouvelaere AV, Collard O, Peyron AC, Pedeutour F.
CCND1 and MET genomic amplification during malignant transformation of a giant cell tumor of bone. J Clin Oncol, 2011, 29:86-9. Watkin E, Devouassoux-Shisheboran M, Pedeutour F, Lagarde P, Salle M, Ranchère-Vince D, Baulieux J, Barnoud R.
A First Reported Case of Dedifferentiated Liposarcoma of the Esophagus with Molecular Diagnosis. J Gastrointest Cancer, 2011, 42 :65-67. Sabatier R, Bouvier C, de Pinieux G, Sarran A, Brenot-Rossi I, Pedeutour F, Chetaille B, Viens P, Weiller PJ, Bertucci F.
Low-grade extraskeletal osteosarcoma of the chest wall: case report and review of literature. favorable outcome in a 57-year-old patient. Haudebourg J, Hoch B, Fabas T, Cardot-Leccia N, Burel-Vandenbos F, Vieillefond A, Amiel J, Michiels JF, Pedeutour F.
Buche S, Delasalle EM, Coindre JM, Pedeutour F, Kolb F, Staumont-Salle D, Mortier L.
Atypical presentation of giant cell fibroblastoma. Ann Dermatol Venereol. 2010 May;137(5):381-5. French. Mathieu- Boué A, Servant JM, de Kerviler E, Janin A, Calvo F, Pedeutour F, Lebbé C.
Imatinib mesylate (IM) as a pre-operative therapy in dermatofibrosarcoma : results of a multicentric phase II study on 25 patients. KRAS and BRAF Mutational Status in Primary Colorectal Tumors and Related Metastatic Sites: Biological and Clinical Implications. Ranchere-Vince D, Saiag P, Terrier P, Lacour J.P, Pedeutour F.
J Invest Dermatol, 130:904-907, 2010. (IF : 5.251). Pierron A, Fernandez C, Saada E, Keslair F, Hery G, Zattara H, Pedeutour F.
HMGA2-NFIB fusion in a pediatric intramuscular lipoma: a novel case of NFIB alteration in a large deep-seated adipocytic tumor. Sirvent N, Trassard M, Ebran N, Attias R, Pedeutour F.
Chibon F, Coindre JM, Pedeutour F.
Clinical and Biological Significance of CDK4 Amplification in Well-Differentiated and Dedifferentiated Liposarcomas. Coindre JM, Pedeutour F, Aurias A.
Italiano A, Cortot AB, Ilie M, Martel-Planche G, Fabas T, Pop D, Mouroux J, Hofman V, Hofman P, Pedeutour F.
Hélias-Rodzewicz Z, Pedeutour F, Coindre JM, Terrier P, Aurias A. Selective Elimination of Amplified CDK4 Sequences Correlates with Spontaneous Adipocytic Differentiation in Liposarcoma. Bidault F, Vanel D, Terrier P, Jalaguier A, Bonvalot S, Pedeutour F, Couturier JM, Dromain C.
Liposarcoma or lipoma: Does genetics change classic imaging criteria? Ilie M, Hofman V, Pedeutour F, Attias R, Santini J, Hofman P.
Oncocytic lipoadenoma of the parotid gland: Immunohistochemical and cytogenetic analysis. Pathol Res Pract. 2010 Jan 15;206(1):66-72. Epub 2009 Apr 5.10. Raoux D, Péoc'h M, Pedeutour F, Vaunois B, Decouvelaere AV, Folpe AL. Am J Surg Pathol. 2009 Jun;33(6):954-8. Marque M, Bessis D, Pedeutour F, Viseux V, Guillot B, Fraitag-Spinner S.
Medallion-like dermal dendrocyte hamartoma: the main diagnostic pitfall is congenital atrophic dermatofibrosarcoma. Italiano A, Maire G, Sirvent N, Nuin P.A.S, Keslair F, Foa C, Louis C, Aurias A, Pedeutour F.
Cancer Letters, 273:323-30, 2009. (IF : 3,504). Italiano A, Ebran N, Attias R, Chevallier A, Monticelli I, Mainguené C, Benchimol D, Pedeutour F.
NFIB Rearrangement in Superficial, Retroperitoneal and Colonic Lipomas with Chromosome 9p22 Aberrations. Cardot-Leccia N, Italiano A, Haudebourg J, Attias R, Amato D, Pedeutour F, Perrin C.
Italiano A, Chambonniere M-L, Attias R, Chibon F, Coindre J-M, Pedeutour F.
Monosomy 7 and absence of 12q amplification in two cases of spindle cell liposarcomas. Rouzier C, Soler C, Hofman P, Brennetot C, Bieth E, Pedeutour F.
Ovarian dysgerminoma and Apert syndrom. Rouzier C, Haudebourg J, Carpentier X, Valério L, Amiel J, Michiels JF, Pedeutour F.
paraffin embedded samples with clinical data. Pruvost C, Calvo F, Janin A, Lebbe C.
Value of cytogenetic analysis in the treatment of dermatofibrosarcoma protuberans. Surace C, Pedeutour F, Trombetta D, Burel-Vandenbos F, Rocchi M, Storlazzi CT.
MYCN is uncommonly amplified in the form of episomes in a case of medulloblastoma. Bianchini L, Maire G, Guillot B, Joujoux JM, Follana P, Simon MP, Coindre JM, Pedeutour F.
Mainguené C, Peyrottes I, Ranchere-Vince D, Terrier P, Tran A, Gual P, Pedeutour F.
Int J Cancer. 2008 May 15;122(10):2233-41. Benchetrit M, Hofman V, Long E, Odin G, Basc E, Pasquier B, Pedeutour F, Hofman P.
Lledo G, Roussel JF, Pedeutour F, François E.
Annals of Surgical Oncology, 15:649-54, 2008. (IF : 3,898). Benchetrit M, Hofman V, Venissac N, Italiano A, Aurias A, Brennetot C, Pedeutour F, Hofman P.
liposarcoma of the mediastinum. Usefulness of cytogenetic and molecular genetics analyses. Cancer Genet Cytogenetics, 2007, 179 : 150-155. Sirvent N, Coindre JM, Maire G, Hostein I, Keslair F, Guillou L, Ranchere-Vince D, Terrier P, Pedeutour F.
utility in diagnosing adipocytic lesions and comparison with immunohistochemistry and real-time PCR. Am J Surg Pathol, 31:1476-1489, 2007.
de Saint-Aubain-Sommerhausen N, Keslair F, Pedeutour F, Coindre J-M.
the morphologic spectrum and suggesting potential relationship to sclerosing epithelioid fibrosarcoma. A study from the french sarcoma group. Am J Surg Pathol, 31:1387-1402, 2007. Jouary T, Beltran C, Coindre JM, Plagnol P, Taieb A, Ebran N, Pedeutour F, Delaunay M.
Dermatofibrosarcoma protuberans occurring in two brothers : role of environmental or genetic factors ? J Am Acad Dermatol, 57:S58-60, 2007. Italiano A, Cardot N, Dupré F, Monticelli I, Keslair F, Piche M, Mainguené C, Coindre JM, Pedeutour F.
Müller CR, Paulsen E, Noordhuis P, Pedeutour F, Sæter G, Vassilev LT, Myklebost O. Potential for treatment of liposarcomas with the MDM2 antagonist Nutlin-3A. Bianchini L, Maire G, Pedeutour F; Groupe Francophone de Cytogénétique Oncologique. From cytogenetics to cytogenomics of dermatofibrosarcoma protuberans family of tumors. Maire G, Fraitag S, Galmiche L, Keslair F, Ebran N, Terrier-Lacombe MJ, de Prost Y, Pedeutour F.
A clinical, histologic, and molecular study of 9 cases of congenital dermatofibrosarcoma protuberans. Cardot-Leccia N, Italiano A, Monteil MC, Basc E, Perrin C, Pedeutour F.
Naevus lipomatosus superficialis: a case report with a deletion 2p24. Br J Dermatol, 156:380-381, 2007. (IF : 3,489). Craver R, Dewenter T, Ebran N, Pedeutour F.
Cancer Genet Cytogenet,168: 155-157, 2006. Harik LR, Merino C, Coindre JM, Amin MB, Pedeutour F, Weiss SW.
Pseudosarcomatous Myofibroblastic Proliferations of the Bladder. A Clinicopathologic Study of 42 Cases. Am J Surg Pathol, 30 :787-794, 2006. Hieronimus S, Bec-Roche M, Pedeutour F, Lambert J-C, Wagner-Mahler K, Mas J-C, Sadoul J-L, Fénichel P.
The spectrum of parathyroid gland dysfunction associated with the microdeletion 22q11. Eur J Endocrinology, 155 :47-52, 2006. Butori C, Hofman V, Attias R, Mouroux J, Pedeutour F, Hofman P.
Diagnosis of Primary Esophageal Synovial Sarcoma by Demonstration of t(X;18) Translocation. A Case Report. Italiano A, Attias R, Aurias A, Pérot G, Burel-Vandenbos F, Otto J, Venissac N, Pedeutour F.
9p23-24 amplification including JAK2 and JMJD2C. Cancer Genet Cytogenet, 167:122-130, 2006. Kostrzewa E, Beylot-Barry M, Vergier B, Pedeutour F, Beylot C.
Ann Dermatol Venereol. 2006 Apr;133(4):359-61. Italiano A, Burel Vandenbos F, OttoJ, Mouroux J, Fontaine D, Marcy P-Y, Cardot N, Thyss A Pedeutour F.
Metastatic Sites: Implications for Treatment with EGFR-Inhibitors. Annals of Oncology, 17:981-5, 2006.